On Borrowed Time(s) showcases the work of students and alumni from MA Photographic Studies, University of Westminster. The University of Westminster is one of three selected academic institutions Iniva will be working with for the year 2014. On Borrowed Time(s) responds to Turkish artist Burak Delier’s exhibition, Freedom Has No Script also showing at the gallery. Through a diversity of critical practices the exhibition explores the paradoxical and contradictory logic of capitalism as manifest in the art world, corporate and consumer cultures. The artworks represented engage in a dialogue between capitalism’s alluring façade and the record of broken promises ranging from economic collapse to environmental degradation. Curated in collaboration with Layal Ftouni. Artists include: Basil Al-Rawi, Xiaobo Fu, William Eckersley, Paula Gortázar, Wilf Speller, Jan Stradtmann and Maria Tzili. Preview: 25 March, from 6.30pm. Exhibition continues until 12 April and is open on Thursdays, Fridays and Saturdays. A talk drawing on themes from the exhibiton, Disruptions: On Capitalism and Photography, takes place on 10 April, 6.30pm, free. Booking advised. Maria Tzili LIFE USER MANUAL 2014 Archival Pigment Print, 33x50cm A user manual is a set of instructions that explain how to install and operate a device, usually technical. In this project, the term is used to mimic the ways in which dominant systems of signs in late capitalist societies have become instructive of a life-style promising happiness, health, safety and success. This project is a series of young people’s portraits at a stage in their lives where certain choices are instrumental to their future. Their portraits are combined with common advertising slogans promising change. The repetitive gestures of four diptychs echo the endless proliferation of desires to consume life as instructed and yet always unfulfilled. 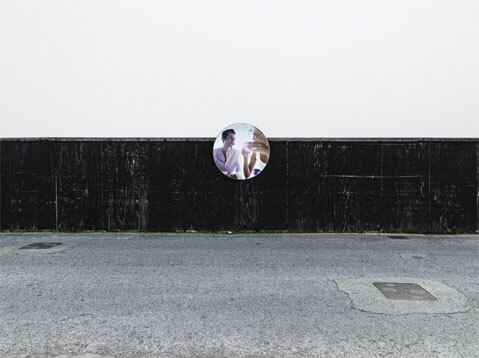 Jan Stradtmann BELGRAVIA (2/6) 2008/2012 Archival Pigment Print, 82x75cm Jan Stradtmann studied Communication Design at the University of Applied Sciences at Potsdam, Germany before graduating in 2007 with an MA in Photographic Studies from the University of Westminster, London. He has won a number of awards including the Magenta Flash Forward in both 2008 and 2009; the German Academic Exchange Service (DAAD) Project Grant, 2008 and a DAAD Post Graduate Grant 2006/2007.Jan has exhibited both in the UK and internationally including at Photofusion, London; The Photographer's Gallery, London; NoorderlichtInt. Photofestival, Groningen, NL; Le bleu du ciel, Lyon, France; House of Photography, Deichtorhallen, Hamburg and the Month of Photography, Vienna. Wilf Speller I WENT TO THE NATIONAL GALLERY AND ALL I GOT WAS THIS LOUSY T-SHIRT 2014 Acrylic on Cotton, Women's XL As the title suggests this work is intended as a playful remark on the clash between high and low culture but at the same time aims to comment on the commodification of art, most explicitly the creation of the artist as author and ultimately as a brand. The T-shirt is presented nailed to the wall mimicking the crucifixion pose, a playful nod to crucifixion iconography in Western Art, a cornerstone of many ‘great artist’s’ oeuvres. The icon is also a statement on the popular fantasy of the great male artist as martyr for their work. Van Gogh’s genius status is spun from his romanticised madness and eventual suicide – author and oeuvre intrinsically bound – this final act cemented his status, highly increasing his fame and subsequently his value as an artist/commodity. Paula Gortazar WINTER HOLIDAYS 2011-2013 Lambda Print, 30x30cm Paula Gortázar is a photo-artist, researcher and lecturer in photography. After obtaining a Law Degree in Madrid, she completed an MA in Photographic Studies in 2011 at the University of Westminster, where she has recently been awarded a PhD scholarship. Her work has been exhibited internationally, including The Photographers’ Gallery, London Film Museum, and published in different media, such as the British Journal of Photography. She has been selected for Flash Forward Festival (CANADA), the International Sony World Photography Awards, Magnum Agency & Ideas Tap Photographic Award (UK) and Westphoto Annual Photography Prize (UK). William Eckersley 24HR NEWS 2014 Archival Pigment Print, 125x95cm Before undertaking the Photographic Studies MA at Westminster, I studied briefly at both St.Martins and LCC. My projects include Left London (2006), an exploration of derelict sites around my home city; U.S.80 (2010), which focused on the first coast- to-coast highway in America; Dark City (2011), showing the de-peopled urban environment at night; and Orwell (2012), which traces some of the locations of the renowned author's life. My work has been exhibited and featured in various shows, competitions, magazines and websites, as well as being held by collectors such as Nike and Sir Elton John. Xiaobo Fu PLEASE DO NOT TOUCH 2014 Archival Pigment Print, 30x30cm Xiaobo Fu (born in 1988) is a photographer and artist based in London and Shanghai. He earned his degree in English Literature in 2010, after which he worked as a fashion photographer for four years. He is now more interested in the practice of art and art photography. Basil Al-Rawi FAÇADE (2/14) 2012 C-Type Print, 60x50cm Basil Al-Rawi is a photo-artist and cinematographer based in Dublin, Ireland. His searching, exploratory photography balances the elegance of symmetry against the desolation of vacancy, capturing architecture in both its primal form and at the end of its life. His photographs depict the world’s irregularities and unfinished enterprises, framing the imperfect in a perfect way. His work has been exhibited and published internationally. Basil has recently graduated of the University of Westminster with an MA in Photographic Studies and is a cinematographer who has worked on numerous short and feature films.